We once considered the Sun a planet, and it took finding Uranus to decide that moons should really be their own category of thing. These are all the places in our solar system that were once planets—but now have far more suitable names. When the Ptolemaic model of an Earth-centric universe held sway, planets were anything that wandered in the sky independently of orderly stars. That covered the five naked-eye visible planets, but also the most glaringly obvious candidates for, “Which of these are not like the others?” ever: the Moon and the Sun. Under this definition, Earth was clearly not a planet since all the planets orbited around it. Ptolemaic model of the geocentric universe as illustrated in the 16th century. The Sun kept its planetary status even after we figured out the other planets orbited it: the Tychonian model of the solar system kept the Earth in the center of the Solar System with the Sun in orbit around it and Mercury, Venus, Mars, Jupiter, and Saturn whirling around the star like demented moons. The Sun was finally demoted as the Copernicus model of the Solar System gained acceptance in the 17th century and we reluctantly conceded that we were the ones on a planet orbiting the Sun, not the other way around. Likewise, the Moon was also eventually demoted—but, before that happened, it picked up a lot more company. The main moons of both Jupiter and Saturn briefly joined the list of planets before helping reshape our views of solar system dynamics. The four Galilean moons of Jupiter — Callisto, Ganymede, Europa, and Io — joined the list of planets after their discovery in 1610. The five main moons of Saturn gradually joined the list with their discoveries — Titan in 1655, Iapetus and Rhea in 1671, and Tethys and Dione in 1684. This explosion of tiny planets orbiting bigger planets led to the creation of a whole new concept: moons. With a unique term all their own (and the final removal of our own moon from planet-status), scientists were able to start talking about these miniature worlds in a manner separate from their larger similar-yet-distinct companions. By the 18th century, the removal of moons and the discovery of Uranus brought the planet count to six. Amusingly, keeping these worlds not planets has repeatedly reemerged in later redefinitions of the term. Ganymede is both the Solar System’s largest moon and the only one (so far!) with evidence of a magnetic field, while the massive Titan has an atmosphere and complex surface dynamics. In 1801, Giuseppe Piazzi accidentally discovered Ceres. Considering we’re still baffled on how to define it even with a spacecraft in orbit, it’s not surprising its discoverers added Ceres to the planet list. Today we alternate between calling it the largest asteroid, the only dwarf planet in the main asteroid belt, or that weird thing over there that’s similar yet different from everything else we’ve found in our solar system. Not long after finding Ceres, astronomers started finding a whole slew of similar objects in the same part of space while looking for a “missing planet” between Mars and Jupiter predicted by a now-discredited theory. Between 1845 and 1851, Pallas, Juno, Vesta, Astraea, Hebe, Iris, Flora, Metis, Hygiea, Parthenope, Victoria, Egeria, Irene, and Eunomia all joined the list of planets in our Solar System. They quickly picked up a unique name — asteroids, but were treated as yet more planets (or possibly the shattered aftermath of a planet’s destruction) in observation records. The new asteroids even acquired those cool single-symbol alternate shorthand notation for ease of reference, although the growing list made the new symbols less elegant than their earlier predecessors. This crowded namespace for new symbols was indirectly what drove the decision to possibly reclassify these new worlds. Annoyed by the complexity of the newer symbols, Johann Franz Encke published his 1854 guide to astronomical objects by streamlining the symbols to everything post-Vesta as simply a number in a circle. The alternate notation quickly gained popularity and sparked an unintended consequence in how the new discoveries were treated — some publications now listed them in numerical order-of-discovery instead of distance from the sun, while others put them in a special subsection isolated from other planetary news. The transition to separating asteroids from the planets was slow, painful, and inconsistent. The Nautical Almanac and Astronomical Ephemeris listed asteroid observations as “Minor Planets, Elements of” from 1841 until 1853, when it rearranged all the new discoveries with the more traditional list of planets. German publications started using Kleine Planeten (“tiny planets” following the notation switch in 854, with the Astronomische Nachrichten classifying them as a subcategory of planets from 1861 to 1932. In France, the Paris Observatory started pulling “petites planetes” from the main list in 1866, although Pallas, Juno, and Vesta did double-duty as both members of the list of main planets and as a preface to the asteroid index until 1868. Meanwhile, the U.S. Naval Observatory couldn’t decide what to do. They listed the objects as “asteroids” until 1868, then “small planets” until 1892, switched back to “asteroid” for a few years, moved on to “minor planet” in 1900, and finally settled on “asteroid” in 1929. In sharp contrast, the Royal Greenwich Observatory kept all the new objects classified under, “Observations of the Sun, the Moon, and the Planets” until 1905. By now, you’re getting the picture that the story of Pluto’s planetary status is far from unique. It’s the most recent object to be adopted into the lexicon, joining the list of planets at its discovery in 1930, and it’s also the only place to lose that status in recent years. While it’s a popular complaint to whine that Pluto was demoted, we’re much happier to consider it the greatest type example in whole new classifications of worlds — dwarf planet, Plutoid, Plutino, and the dominate partner of the first binary planet system. Pluto’s massive moon Charon never made it to full planet-status, but as the largest moon in proportion to its host, it’s mucking up classification by opening a new, related debate: Where do you draw the line between moon and binary dwarf planet? With the advent of new technology, the early 2000s led to a burst of discovering new worlds on the freezing fringes of our solar system. Each new world briefly bore the moniker Planet X or the 10th planet, only to have the title hijacked by another, newer discovery. In 2003 we spotted Sedna. It is just three-quarters the size of Pluto, but on an even more distant and lopsided orbit. From its current close approach of merely 13 billion kilometers (8 billion miles), the ball of rock and ice will swing out to ten times the distance at a staggering 130 billion kilometers (84 billion miles) over its 10,500-year orbit. While it quickly earned the nickname of the tenth planet or the second red planet, Sedna never formally made it onto the list of official planets in our solar system. Instead it became the first of the trans-Neptonian Objects, and the first contender for an Oort Cloud object. In 2005, we ran into the same problem again, but this time with Eris. The newest world was another distant rockball of roughly the same dimensions as Pluto but more massive. 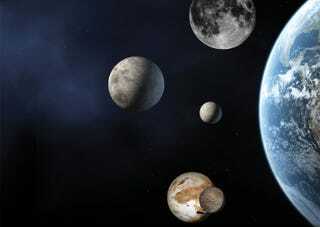 Surely if Pluto was a planet, Eris had to be one, too! Although it certainly carried the tentative classification of planet during initial observations and reports, Eris never formally made the list. Instead, it sparked the now-infamous debate amongst the International Astronomical Union to create a scientifically-based definition of planets to deal with these new worlds before we were overwhelmed in a flood of discoveries. The creation of the dwarf planets came just in time: soon Sedna and Eris and the reclassified Ceres and Pluto were joined by the discovery of Haumea and Makemake. Now we have a whole cadre of candidates for dwarf planet status if we could just catch up with officially recognizing them! What Makes a Planet, A Planet? [D]oes gravity dominate the shape of a body if the cross-section deviates from hydrostatic equilibrium by 10% or by 1%? Nature provides no unoccupied gap between spheroidal and nonspheroidal shapes, so any boundary would be an arbitrary choice. Meanwhile, Mike Brown mocked that relying solely on roundness created a Leave No Iceball Behind scenario. The number of round-ish asteroids, Trans-Neptonian objects, and Kuiper Belt Objects is enormous: our list of planets in the Solar System could’ve easily jumped to 50 overnight with more being added all the time. The final definition of a planet is that an object must be in orbit around the Sun, spherical, and massive enough to dominate its orbit. Although this is in some ways arbitrary, it works well enough at excluding moons, asteroids, comets, and the rash of new Kuiper Belt Objects. Although many people are unhappy that this debate eventually led to Pluto losing its planetary status in favour of joining the new category of dwarf planets, it saved us a repeat of the asteroid debacle by clearly identifying a new category of objects before our previous system was swamped into uselessness. However, it did lead to a new problem: Is Earth actually still a planet, or are we just flattering ourselves? Our current definition of a planet has a flaw: it only works for our Solar System. Under the definition of orbiting the Sun, not any star, the literally hundreds of exoplanets aren’t actually planets at all. If we adjust the definition to be less Earth-centric for alien solar systems, how many subcategories of planets are we in for? Along with our own terrestrial planets, gas giants, and ice giants, we’ve found hot Jupiters, mega-Earths, boiling-hot icy waterworlds, and gas giants bordering on igniting into stars; you know we’re going to find even more confusing worlds as we keep looking. That still leaves out rogue planets adrift in space, at least until they get captured by a nearby star. And what should we do about isolated former-stars, dead stars that fizzle out into lumps of helium or diamond? Or sub-brown dwarfs that are almost but not quite big enough for fusion and are instead awkwardly enormous gas giants? The debate over what is a planet is long and ongoing, evolving with our changing understanding of the world around us. It reflects how we prioritize the intrinsic properties of a world and what we understand about the importance of circumstance and history of how the world came to be. Our solar system might have just four planets and leftover debris, or the planets might number in the hundreds including asteroids, dwarf planets, and the Kuiper Belt Objects we’ve yet to discover. But one thing is certain: However the definition of a planet changes next, someone is going to be angry about it.